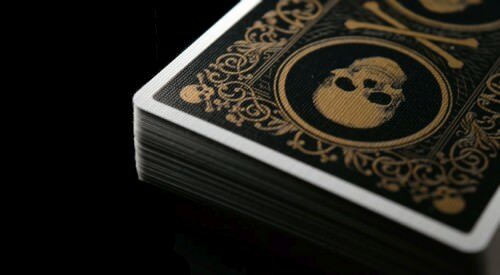 In the playing card industry, the United States Playing Card Company (USPCC) has been the biggest gun in the business for a long time, and they have earned a well-deserved reputation for high quality playing cards. But in recent years some publishers that are primarily Taiwan-based have emerged as respected competitors, not so much in terms of the volume of cards produced, but in terms of quality. The best known among these are Legends Playing Card Company (LPCC) and Expert Playing Card Company (EPCC). These two companies often collaborate, and have become a popular choice for producers of crowd-funded custom playing cards. Unlike playing cards produced by USPCC, playing cards produced by LPCC/EPCC tend to be stiffer and more durable. Their popular Diamond/Master finish is one of the thickest and longest-lasting decks on the market. Meanwhile their also-popular Classic finish has a card-stock with an embossed air-cushion style finish that closely resembles and handles like your typical USPCC produced Bicycle style deck. But LPCC/EPCC continues to experiment with new stocks and finishes, exploring new territory. In the last year or so they have used a stock that is slightly thinner than their signature Diamond finish, and given this new stock the name "JN finish". Besides this, they've also come out with a super-soft stock that is great to handle, and was used for both their "STUD finish" and their "Cardistry finish". 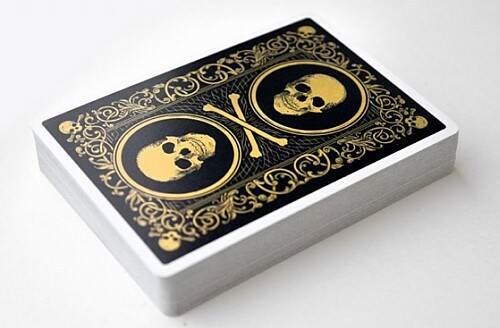 In this article I'll review these new stocks by covering the two Skull & Bones decks that were produced in order to demonstrate the new JN and STUD finishes, as well as another deck which employs the new Cardistry finish. The JN finish is named as a tribute to the one of the all-time most famous decks of cards, often considered the ultimate collector’s piece. These are the classic Jerry’s Nuggets decks (hence JN), a highly regarded casino deck from the 1970s, and legendary for the handling of their card-stock. The new JN finish from LPCC/EPCC was created to honour this classic, and while it might not be an exact for the Jerry's Nuggets, it is deliberately geared to be a thin and durable stock that is reminiscent of this classic. Certainly the JN finish stock is one of the most durable you will come across in the world of playing cards, with the Diamond/Master Finish from LPCC/EPCC being slightly more durable perhaps. The cards have a look and feel much like the Diamond/Master finish, but have been crushed .01mm thinner. This equates only to the thickness of a single card over the course of an entire deck, but a skilled cardist and experienced card handler will be able to tell the very slight difference in snap/feel. I let an experienced card flourisher take a deck with the Diamond finish and a deck with the JN finish for a test drive, and he actually preferred the JN finish above the Diamond finish, due to the cards being ever so slightly thinner. The JN finish is a replacement for LPCC's Emerald finish, and from now on you can expect to see the designation JN finish instead of Emerald. Very few decks have been printed with the JN finish until now, but some known decks include the Legal Tender deck by Jackson Robinson, the SINS deck by Giovanni Meroni, and the Meow Deck by Malota. Besides that is the sample edition of Skull & Bones, which I've given an intensive workout, and which is largely the basis of this review. A version of this deck in the STUD finish was also produced, but what follows first is my experience with the version of the Skull & Bones deck in the JN finish. These cards are printed on an imported European black-core paper, like the Diamond finish cards. However, they are crushed slightly thinner, and so the result is a thinner and slightly softer deck than the Diamond finish decks. While they might be `softer' when compared with the Diamond finish, the JN finish is still anything but soft. It's still a super snappy and rather stiff deck, which means that it is long-lasting, since it won’t bend out of shape easily. The embossing pattern is very similar to the well-known “Air Cushion Finish” from your typical Bicycle deck, but is not as deeply embossed into the cards. The cards feel quite smooth, yet once broken in, they fan and spread very evenly and consistently, even after a lot of use, if they are kept and cared for. Out of the box they might not fan and spread very well, but once they are broken in, I've found that they handle a lot better. There has been some real controversy about this finish, with some disliking it, and others (myself included) loving it. Part of the reason for this is that unlike most of their other decks, LPCC/EPCC hasn't produced these in their usual factory in Taiwan but in China. Some real quality control issues were reported with the initial decks produced with this finish, such as with the Legal Tender decks by Jackson Robinson. 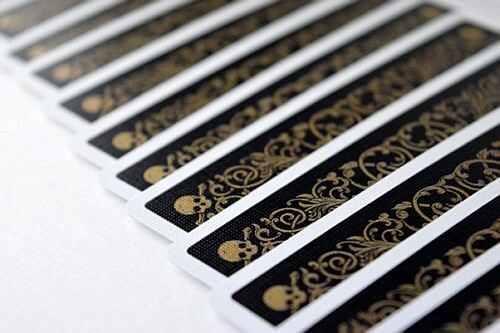 However it seems that the more recent decks with the JN finish appear to have resolved these issues, and certainly my personal experience with the Skull & Bones deck has been positive. Admittedly, these cards don’t spread and fan as smoothly and easily over each other like USPCC decks, especially out of the box. But I have found them to still fan and spread quite evenly, but it does require a bit more work and control to accomplish this. On the other hand they do cut and packet very beautifully, more so than your average USPCC deck. These cards have a beautiful and high quality print registration, which refers to the accuracy of the printing on the cards. Unlike what you see in some USPCC decks, there is no variability, which especially can become an issue for a USPCC deck with narrow borders, quickly making any latitudinal or longitudinal error very noticeable. These cards also have a very smooth cut that feels great to run your fingers over the edge of the deck, and they faro beautifully. While there has been some negativity towards Chinese printed decks, and perhaps with good reasons, the two decks that I've sampled with the JN finish (the Skull & Roses deck depicted here, and the Meow deck) have been more than satisfactory. I have absolutely hammered the Meow deck over several weeks to see how it would perform. 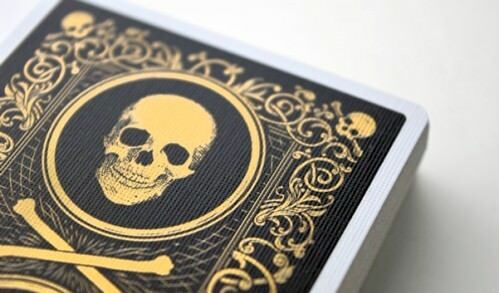 While it didn't quite match the performance I had with the Skull & Bones deck, it was still fairly solid. After giving it an extremely good workout, it still fans reasonably well, and definitely performs much better than an MPC produced deck in that regard. As far as just the fanning goes, I would give it at least a B+ rating. It is a little clumpy in places, but that's probably the result of grime and oils that have begun accumulating on the cards, given how much of a beating I have been giving it. I also wonder whether the heavy use of metallic inks is a factor here, because with the Meow deck the borderless backs feature a significant amount of metallic ink, while the faces also use metallic gold for all the traditionally red suits. The JN finish cards are super durable and snappy which is great to have, and once broken in they fan and spread consistently, even after a lot of extensive use. Some might not like the fact that the fanning and spreading isn't quite as smooth as a USPCC deck, and I can appreciate this point of view. Others might not like the stiffness and durability of the deck, which does result in an almost plasticy feel of the deck. On the other hand a deck that is long-lasting means you can get your money’s worth out of it. Overall, I'm very impressed with the JN finish, and consider it an improvement over the Diamond finish. 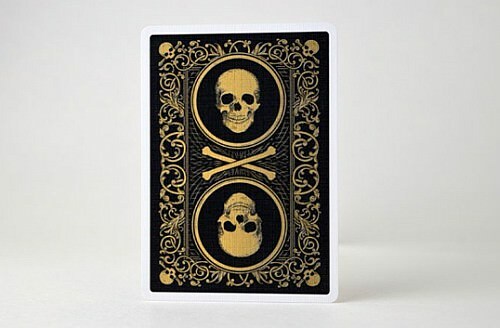 It also deserves to be mentioned that the card design of the Skull & Bones decks is by noted designer Jackson Robinson, and is a reworking of the original Skull & Bones decks that were published previously. Besides some changes to the design on the cards, the cards feature a new level of metallic inks, for a truly elegant and stylish look on both the card faces and card backs, and these metallic inks really do come across beautifully on the JN finish. The STUD finish inherited its name from the classic `Stud' decks of cards, which are renowned for their super thin and soft stock. Since this finish is named after a soft stock deck, it is no surprise that the cards with the STUD finish would be nice and soft. And indeed they are, making them super soft, and in my experience this is the softest deck that LPCC/EPCC has ever printed. 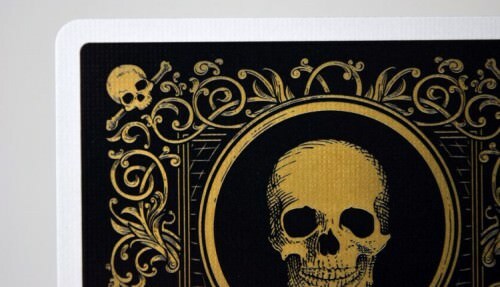 But it's also an extremely rare finish, because LPCC has only printed one deck with this exact finish, namely another sample version of the Skull & Bones deck, which was produced in very low numbers. That makes it super rare! This stock and finish might not be as thin as the classic Stud decks, but don't let that fool you, because these cards are still very soft. The card stock used is a paper which is much softer than any of the other LPCC/EPCC decks, and yet in my experience has proven to still be quite durable, even more so than the thicker Classic finish decks. The softness of the cards makes it great to spring or pressure fan the cards, and magicians and cardists will love that aspect of these cards. The embossing pattern is like that of the typical Air Cushion Finish, and is embossed deeper than the JN finish. The cards of this STUD finish deck actually have no coating at all, which is immediately noticeable on the handling, making it feel very `dry'. As a result of this, out of the box they simply do not handle well, as they don’t spread and fan smoothly, which is to be expected due to the lack of coating. I don't know for sure, but since nearly all decks these days are produced with some kind of coating, I can only guess that these were produced without a coating, simply as a kind of experimental prototype, to see how the stock would turn out. Despite this, I have found that after using the deck extensively for a while, the handling has improved a lot. To my surprise, now the cards fan and spread well, and while they may not impress from the outset, their handling definitely gets better with good use. One advantage of the dry feel is that these cards don't make your hands feel oily from the coating, which you typically can get with many other decks. One down-side, however, is that due to the materials used for the paper-stock, solid colours won’t print as darkly or evenly as other paper stocks used by LPCC/EPCC. On the positive, however, these STUD finish cards also do have the usual super smooth cut that we've come to expect from LPCC/EPCC produced decks, and this also means that they can be faro shuffled smoothly and easily. My only real regret with these cards, aside from the absence of a coating (which does have other advantages, as mentioned already), is that they are super rare, and we're not likely to see many more like these. Like the Cardistry finish deck that I'll discuss below, these playing cards are printed on a stock that is custom, low stock, and rare. That means that cards with both the STUD and Cardistry finish (which use the same stock - the only difference being that the Cardistry finish does have a coating), are not likely to be printed frequently. For me, that's a disappointment, as I've found them great to handle. Straight out of the box the softness of the cards was amazing, and while this deck did need to be used a bit before it could spread and fan well, it's been worth it in the end. The possibly limited nature of the card stock makes the stock even more special, and anyone who loves soft decks will really appreciate it. 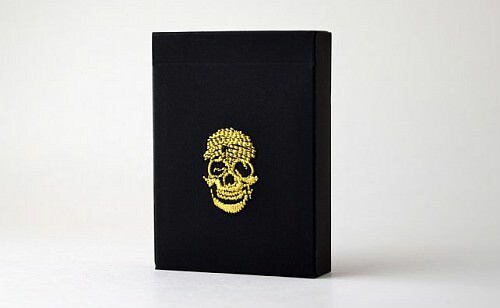 One other thing worth mentioning about the two Skull & Bones is in relation to the tuck box, which showcases some of the innovation and creativity that LPCC/EPCC is capable of. Not only is the box made out of a jet-black card-stock with a very soft, smooth, and durable feel, but they also feature stunning embroidery in gold for the actual design! Another new and exclusive finish that has been produced by LPCC/EPCC is their Cardistry finish. It's obvious already from the name, but this finish and stock is ideal for cardistry. 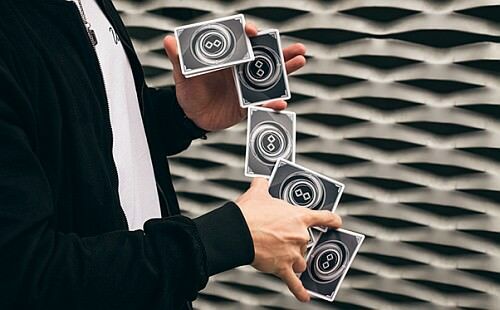 Cardistry imposes a unique set of requirements on a deck, due to its emphasis on smooth handling, and especially the need for durability. There is very little that takes more out of cards than cardistry, as intense card flourishing really hammers a deck! 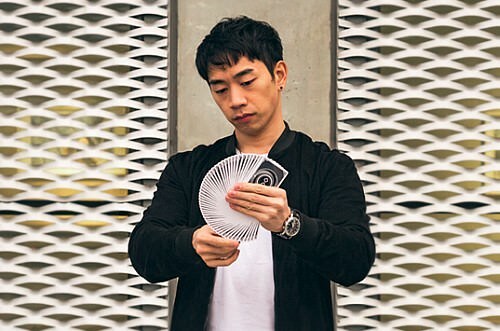 Cardists also tend to be quite fussy and particular about card stock and finishes, and tend to have a real preference for certain cards that are ideal for card handling. The Cardistry finish from LPCC/EPCC attempts to cater to this need, and in my view has done an excellent job. The Cardistry finish actually uses the same paper stock as the STUD finish. As mentioned already, this is a super soft stock, and it handles like a dream. Most of what has already been said about the STUD finish also applies to the Cardistry finish, so I won't repeat everything that has already been mentioned, but there is one important difference to note. While the STUD Finish does not have any coating on the cards, and only features embossing, the Cardistry finish uses the same embossing, but adds a coating. The coating used for the Cardistry finish means that these cards can spread and fan much better straight out of the box, which was not the case with the STUD finish. So the Cardistry finish effectively has all the strengths of the STUD finish, but with the added strength of a coating to ensure smoother handling. Once again, these cards are super soft, and since they can retain their shape very well, they are also quite durable. 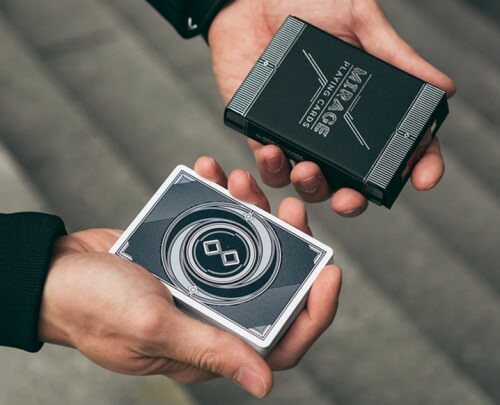 Cardists love decks that handle well out of the box, and the combination of stock and embossing in the Cardistry finish is a perfect combination, being both soft and smooth, and few cardists will find themselves dissatisfied with their feel or performance. As mentioned already in connection with the STUD finish, this paper stock is a quite rare and custom stock, and so we aren't likely to see many decks that use it. One deck that has been published with the Cardistry finish so far is the Mirage V3 (Eclipse Edition) Playing Cards by Patrick Kun, which was produced by Legends and printed in their factory in Taiwan. This deck has been designed to serve both magicians and cardists, and is almost certain to be enjoyed by both. For more information about this terrific deck, see my detailed review here. It's great to see companies stretching the boundaries of the familiar and being willing to explore new territory. I still love USPCC produced playing cards, but over time I've also come to notice their weaknesses, notably their inconsistent printing registration. And at the same time, I've come to appreciate some of the options provided by other reputable publishers, like the decks covered in this article. 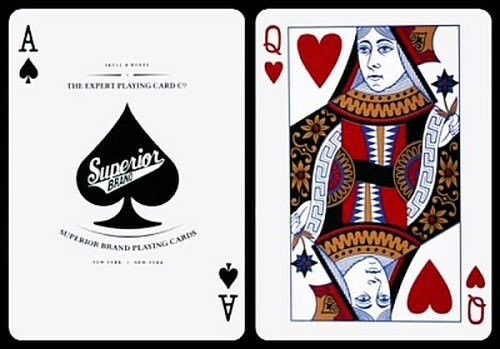 Both Legends Playing Card Company and Expert Playing Card Company have enjoyed a growing reputation in the playing card industry, and are noted for producing quality products, making them the publisher of choice for many crowd-funded projects involving custom playing cards. Their cards do feel and handle differently than a traditional USPCC produced deck, but they do offer some noticeable advantages, such as their crisp and accurate print registration, clean edges, and remarkable durability. Not everyone appreciates the difference in handling, but there are certainly many who even prefer how their cards handle above USPCC produced decks. Results from their Taiwanese factory have typically been impressive, and it will be interesting to see (with the benefit of time and experience) whether they'll be able to match that quality in decks produced in their Chinese factory, particularly those with the JN Finish. The JN finish in the two decks I've seen has proven to be quite satisfactory and durable, making these decks particularly well suited for card games, due this finish being so long lasting. Being slightly thinner than the Diamond/Master finish from LPCC/EPCC also means it is slightly softer, while still retaining a pleasant snap. In comparison, the decks with the Cardistry finish and STUD finish have cards with an amazingly soft stock, which unfortunately appears to be a limited supply. It is great to handle these soft decks as they feel so soft in your hands due to this papery stock. Despite the possibility of this being a rare finish, we can only hope that we'll see more decks printed using this paper-stock, particularly with the stunning Cardistry finish like the Mirage V3 deck, due to its outstanding quality and handling. I look forward to seeing where the ongoing pursuit for innovation and constant quest for perfection will take LPCC and EPCC next!